Maximize fire safety in service stations. Service stations dispensing flammable fuels can avoid serious hazards only by adhering to specialized guidelines. 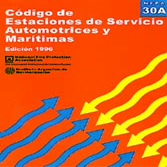 The Spanish NFPA 30A provides rules for piping, fuel dispensing systems, service stations inside buildings, and the full range of operations.